Hmm. getting a little carried away with ordering Spoonflower fabric. (I've ALWAYS liked to see my name in print, so this must just be an extension of that need.) This week I'm meeting with my friend Ileen. She's got patterns, ideas and she's a fantastic seamstress. 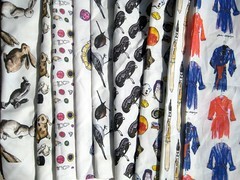 Here's my flickr set of Spoonflower fabrics so far. I love the smaller buttons and rabbits, and the birds are adorable. You have a knack for this, Jane! Have you submitted any of your patterns for their weekly contest yet? yes, I have submitted to the weekly contest. thanks! wish me luck. I'll keep submitting! Oh, I totally agree with Denise: these are all so fabulous! Can we all say that we 'knew' you when??? Best of luck in the contests...your designs are so wonderful! For a newbie to this site...the fabric is a little...amazing. I understand that you have painted the designs but how did they get on the fabric? Do you send them to the Sunflower place...how is this working?